(L-R): Kola Oyekunle, Director of Corporate Governance, Nigerdock; Adewale Dosunmu, Head of Legal Affairs, Nigerdock; Rita Aniche, Head of Northern Zone, Nigerdock; Gen. I.B.M Haruna (Rtd. ), Director, Nigerdock; Alex A. Okoh, Director General, Bureau of Public Enterprises (BPE); Yusuf Abdullahi, Chairman of Nigerdock Free Zone and Baba Mohammed, Head of Capital Markets, BPE, at the presentation of the BPE/Nigerdock Joint Committee Report on the Resolution of Outstanding Issues in Nigerdock Nigeria Plc in Abuja. Director-General of the Bureau of Public Enterprises (BPE), Mr. Alex A. Okoh has assured the Board and management of the Nigerdock Nigeria Plc that the Bureau is committed to the full realisation of the potentials of the integrated engineering and Fabrication Company. 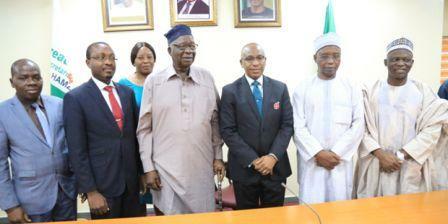 Receiving a report of the BPE/Nigerdock Joint Committee on the resolution of outstanding issues in the company in Abuja, the Director General said that the present comatose state of the company was worrisome to the Bureau hence the decision to set up the joint committee to look into the issues militating against its operations. He regretted that the company which was capable of employing about 6,000 Nigerians off the labour market and boosting the Nigerian local content policy, had only about 500 employees thus; negating the core essence of privatization. Okoh said that the necessary frame work would be put in place to ensure that the company is patronized locally since it has the capability to deliver on its mandate. “We shall look closely at all the issues militating against the smooth operation of Nigerdock. Patronage should not be denied the company because it has the capability to deliver. We should do everything possible to ensure that the company assumes its pride of place”, he stressed. The Director-General stated that the report would be carefully studied and its recommendations escalated to the appropriate authorities for action. Earlier, a director of the company, General IBM Haruna (rtd) had pledged the commitment of the Board to collaborate with the Bureau to ensure that the company survives and realises its potential. He said the company apart from its core functions, was capable of conducting research for the Navy and Army if fully supported by the government. The director expressed the hope that with the synergy with the BPE, that was achievable and called for openness, integrity and transparency. Presenting the report, the General Counsel of Nigerdock, Mr. Adewale Dosunmu said it was in two parts. He said it proffered short-term and long term solutions to move the company forward.